These aren’t just any old switches, and they don’t rely on rubber domes with an undetectable actuation point either. They’re dedicated, pro-level mechanical switches with solid, mush-free and totally trustworthy action. The Romer-Gs are carefully designed. Actuation requires a feathery 45g, and the key fires—with a click you can feel—after just 1.5mm. Their total travel is actually 3mm, so unlike membrane keys there’s no hard stop at the actuation point. Actuation time is 25 percent quicker than rival mechanical switches, and almost twice as fast as ordinary membrane switches. All this means lighter strokes and faster transitions between keys, because the mechanical feedback stops you having to mash at the keys until something happens. Pros: You’ll own everyone without having to buy one of those weird finger-strengthener springs. Cons: Normal keyboards will feel like you’ve got socks on your hands. The G413 offers 26-key rollover, meaning it can handle you pressing 26 keys at once—say because you’re playing an RPG and life’s getting complicated, or because you’ve accidentally started reading the comments somewhere and all your dreams for the future have collapsed, along with your upper body. What’s more, the dedicated gaming mode deactivates problem keys (such as the Windows key) in case you do fumble. The G413 ships with 12 additional gaming keys, plus a key puller, for full customizability. Pros: You’re in total control. Cons: It’s all your fault. Sound is vital in creating emotional responses—just ask anyone who’s smiled at the thunk of a luxury car’s door. And you just can’t beat the rumble of proper mechanical switches in full gaming flow. The Romer-Gs, however, offer a more silent gaming experience that won’t distract you with unnecessary noise in the heat of virtual battle. Pros: Your games feel sharper, richer and more involving. Cons: Work typing is going to seem even duller. The G413’s keys have been tested to 70 million presses—regular keyboards generally top out around 5 million. The tough, 5052 aluminum-magnesium alloy top plate, burly chassis and braided cabling are built to last an equally long time. Its dedicated media controls, programmable macros, replaceable keycaps, one USB 2 pass-through port and highly portable size mean you’re not going to want extra features any time soon, either. Sure, 14 cheap keyboards would last as long as a single G413, but they’d have to be very cheap. Think seven Euros/Dollars each. Good luck! Pros: It will outlast a nuclear war. Cons: The cockroaches might be better than you at Fallout. Seriously. 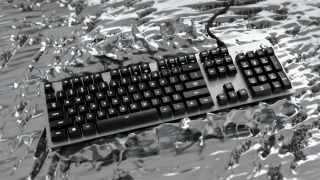 This keyboard offers two classic, classy looks that will have everyone staring like Jennifer Lawrence just walked in with Ryan Gosling and they both morphed into you. The Silver option comes in brushed aluminum with white LED backlighting, while the Carbon offers black aluminum with blood-red light. The layout is stylish yet low-key—even the underneath makes you looks good with cable management grooves that help keep wires from becoming a mess. So trust us when we say this: one glimpse of your Carbon or Silver G413 mechanical gaming keyboard and admirers will be forming an orderly queue. The ones who know their gaming, anyway. Pros: Just seeing it makes you want to play games.